Is there a culinary Easy Button? I mean, one that doesn’t involve pizza delivery? Because some nights, I just want things to be easy. If I have to defrost or measure, it’s too much work. Do you have those nights? I’m guessing it’s not just me. This recipe is becoming one of my “go to” meals for those nights. You only need one pan, a cutting board, a knife, a spoon and a spatula. And the whole dish cooks in about 20 minutes. What’s not to love? Adding to the love, the Swiss chard in our garden is going berzerk. Swiss chard is super easy to grow, pretty to look at with its multicolored stems and it keeps growing even after you cut it. Did I mention it’s a super food? Yep, it sure is. It’s a miracle plant, I tell you. If you have a little patch of soil or a raised bed, I highly recommend growing these greens. A note about fungi. This recipe uses mushrooms, which I know are a controversial vegetable (or fungus?). Regardless, people either love them or hate them. I personally love them, Ellie hates them. If you have haters in your family, just substitute something else for the mushrooms. Red bell peppers would be good, especially if they are roasted. Or even white beans. Go crazy! One thing you should not skimp on with this recipe are the eggs. Eggs are a centerpiece in this dish, so use the best, freshest eggs possible. 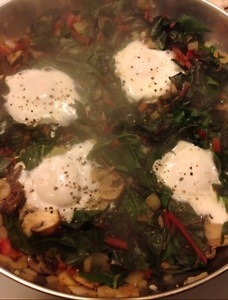 You can cook the eggs to your preference, but I like the yolks runny–they become magic with the greens. 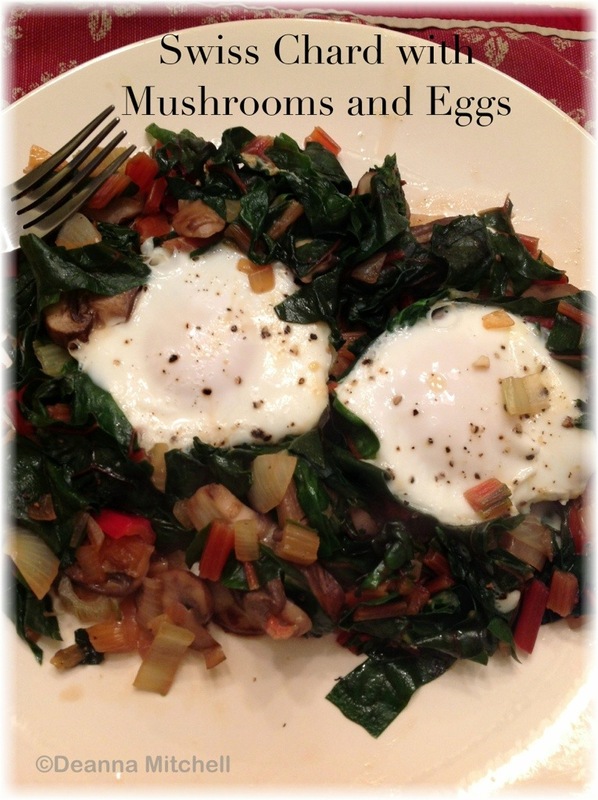 This is one good place to use those $4.00/dozen farm eggs because you will really taste the difference. Trim the stems off the Swiss chard and dice into similar sizes to the onion. Add chopped stems to the onion. In a saute pan, heat the olive oil over medium heat. Add the onion and chard stems. Cook for about 5 minutes, until onions are soft and stems have started to soften. Stir well. Season to taste. Add mushrooms to the pan and cook for about 2 minute, stirring well to keep vegetables from getting too brown. Take your spoon and flatten the greens and veggies. Make four depressions in the greens. Crack one egg into each depression. Season top with salt and pepper. Cover and cook 2 minutes, until eggs are opaque and set, but yolks are still runny. Remove from heat and use a spatula to divide the pan of greens in half. Lift greens carefully with eggs intact and plate.